The team behind Baby ESP are looking for some beta testers willing to give their app a thorough evaluation. After conducting some internal/private testing of their own, they are seeking up to 100 more users to test their server capacities and try to break the app. So what is Baby ESP? It’s an app that helps parents and caretakers track when baby Eats, Sleeps, and Poops (ESP). Get it? 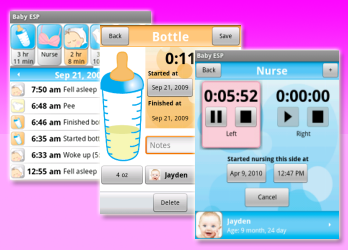 Designed by and for tired and stressed parents, Baby ESP provides a central place to track all of your baby’s activities with the push of a button. Headed out for the evening and want to make sure the sitter knows what to do and when? Hand them Baby ESP. This way, they can see how often the baby eats, when to expect a nap, and more! Track breast and bottle feedings with time and length of feeding and the quantity eaten. Time each nap and figure out what the baby’s sleeping habits are and how they change over time. Track your baby’s regularity and budget diaper expenses and estimated needs for each day. Setup reminders to notify you of a needed dosage of medicine or to get your baby in the habit of eating every few hours. If you would like to try out Baby ESP, the developers have set up a beta page at http://www.babyesp.com/beta.html that provides a link to login and get started. The first 100 users who get in will have access!